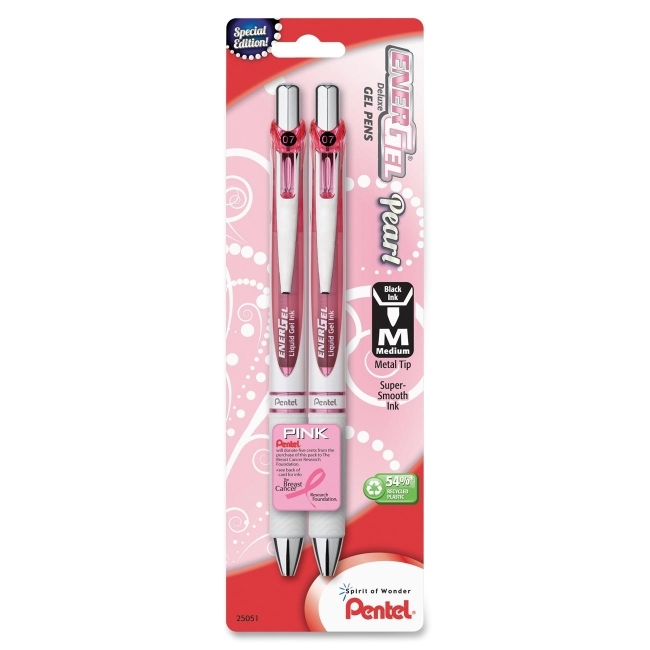 Elegant, retractable gel pens feature a pearly white finish with pink accents and high-performance ink technology that combines the best qualities of liquid and gel ink for a super-smooth writing experience. Gel pen also raises breast cancer awareness, and a portion of the proceeds from this pen will be donated to the nonprofit Breast Cancer Research Foundation. Black gel ink dries so fast even left-handed writers love it - no smears, no smudges, no globs. Sleek and stylish barrel design with stainless steel accents delivers a professional look. Latex-free grip provides maximum comfort and control. Energel Pearl Deluxe RTX also features a 0.7mm metal tip. Refillable gel pens contain a high percentage of recycled plastic.